Well, here's that snow I was talking about! These photos were taken last week, and it's still frigid. Although I certainly faked it through these photos, didn't I? Haha, I'll be honest, I would've been perfectly warm if I'd had some gloves! My hands are the worst during the cold - I have a terrible case of frostbite, and whenever the temperatures dip, my fingers get stiff and difficult to move. My faux-fur lined vest kept me plenty warm up top, and the trick to staying extra warm, even when wearing pants, is to layer fleece-lined tights underneath! I stay so cozy when I layer like that. Aren't these coated jeggings spectacular? I love the burgundy shade for fall and winter! So the following conversation between Corina and I probably sums up how we feel right now about dead week. "I hope the end of the world happens this week." "Or the zombie apocalypse. Man, that'd be awesome." "Is it bad if I wished there was a deadly plague that wiped out half the population? I mean, if that happened surely they'd cancel school." "Wait, what if we got wiped out too??" "Fine, just the northern half of Idaho then." Haha, so there you go. I'm sure many college students can relate. Hang in there, we're almost done! Some of you probably already are...finals are next week and then we'll finally be done! Okay you look adorable! LOVING that hat. Good luck with all your finals. You can do it! Love how everything harmonies here: the burgundy, the leopard and beige...very nice!! Great photos! You have less snow than we have here. I love the crisp blue sky against the snow. (don't like the inversion, tho) If the winds keep up then it is so pretty here! Thank you for being a great blogging buddy this year!!!!!! (it was around this time last year that we started blogging with each other, i think) I remember your trip to the Philippines last year after school was over. Going again? I love it your neckacle! I would have been freezing / LOOKED freezing in photos like these! Adorable look, the leopard is a great touch! Well I guess the only thing I can say for next week is good luck?! I love, love, love this outfit of yours, great colour combination and I love the pop of leopard print. Gorgeous leggings and vest! I totally agree with you, layering tights underneath your trousers keep you so warm, a trick I do every Winter.x Pretty as always! Hi Linda, you have fine tuned the art of putting an exceptionally chic boho look together, love this! The vest is adorable and I want the hat. All the best for finals hun! burgundy sure is a beautiful shade and I can't get over it either (for me it's the same thing with mint. I don't even have many mint pieces but every time I see mint shade items I fall in love). I also love it how you have layered leopard print with faux fur and a cosy sweater. this indeed must be super warm! lovely pictures! and the color of the pants is great, yeah I can relate, it's freaking COLD here now too! good luck with exams! I absolutely adore your necklace, i'm a huge fan of hunger games! I love your leopard layer! ;) I love me some animal print, girl. W got about 6 inches of snow here and then 2 more a couple days later so I feel ya! It's kind of a pain. these photos are gorgeous linda, so jealous of your snow! and awesome outfit, love the layered leopard shirt peeking out! 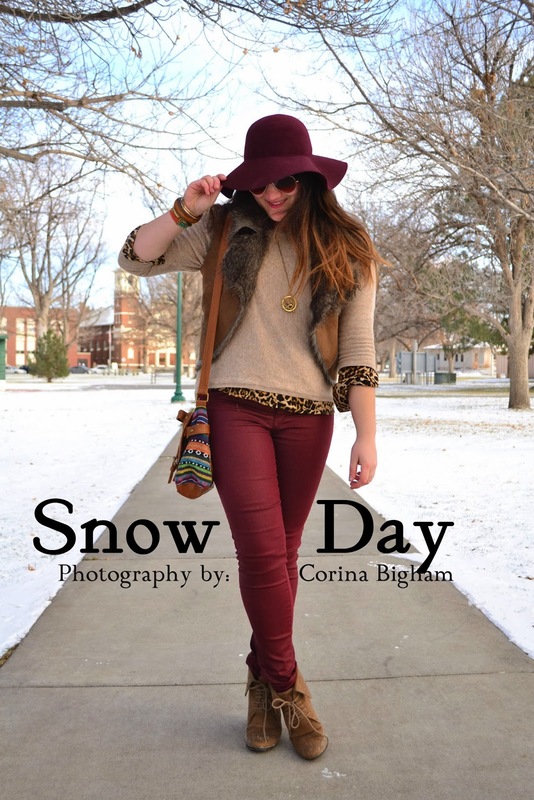 Love your burgundy coated skinnies and that vest and Leo print! But please stay warm!! BTW , I FOLLOWED U WITH GFC & BLOGLOVIN , WANNA FOLLOW BACK MAYBE ? Nice outfit! I like the touch of leopard! Gotta love the snow :-) And your outfit for that matter! Every little details is so perfect! this is really an interesting winter outfit Linda!!! LOVE the details and the peek-a-boo print of leopard!!! 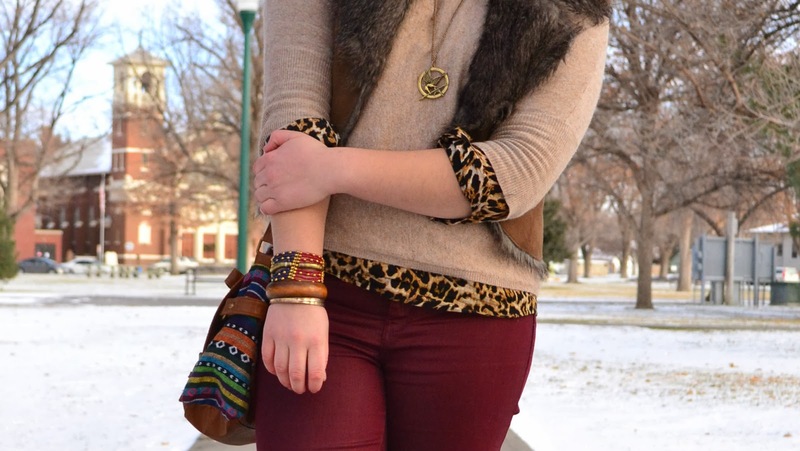 I love leopard and burgundy, one of my favorite combinations!! Haha I absolutely can relate! Good luck on finals; we're almost done! Love all these layers! This hat just looks fantastic on you. I'm so happy to have time to catch up on your blog again! I'm not in college but I still have those thoughts with some friends some time too LOL! Love the maroon and brown hues mixed together! 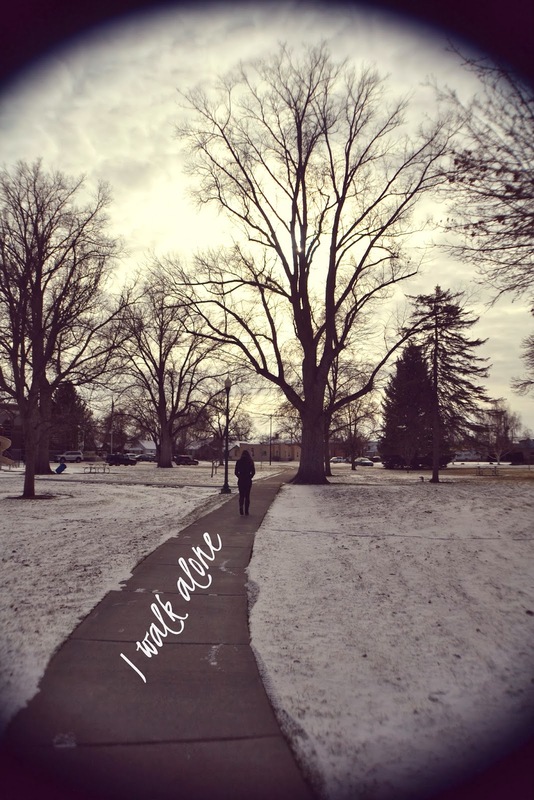 As for finals and the cold -- I am right there with you. All around miserable! Looks like the perfect snow day. You picked such a cute outfit, too. Love the colour of your jeans and the touches of leopard print are the perfect addition. I LOVE YOUR PANTS OH MY GOD!!!!! How perfect is this hat?! I've been on the prowl for a beautiful brown/tan/maroon felt hat, and this one is so lovely!